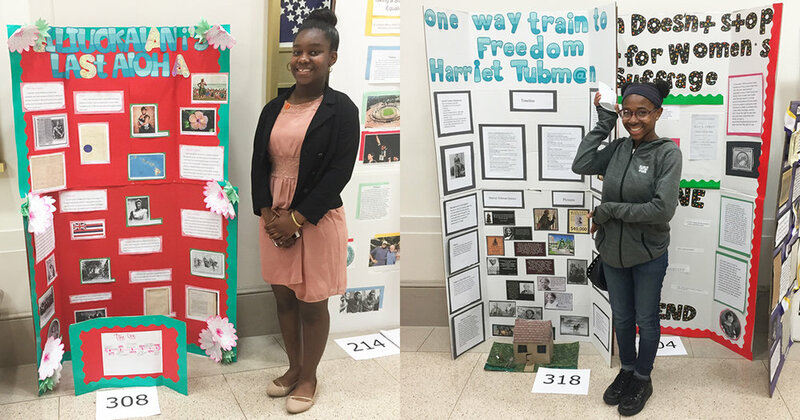 National History Day projects are a wonderful opportunity for middle and high school students to research and learn about topics and individuals outside the typical textbook. We share here the experiences of D.C. eighth grade middle school teacher Beth Kara. Her students’ completed projects on Queen Liliuokalani, Sophie Scholl and the White Rose, Assata Shakur, Muhammad Ali, and many more people of note who stood fought for social justice. It’s a little funny that I live across the street from the University of Maryland, College Park, considering I received both of my degrees from that institution. It’s also funny that the first I heard of National History Day (NHD) was from an email on my local email listserv calling for judges for the national competition at UMD, considering I’d been teaching middle school social studies for 8 years. I signed up to be a judge for the national competition. I was completely unprepared for what I would “encounter”! Each year a theme is chosen, and students must make an argument about how their topic relates to the theme. The year I was a judge, the theme was “Exploration, Encounter and Exchange” (the 2017 theme is Conflict and Compromise in History). While some students chose obvious topics, such as Apollo 11, others presented topics that were unique. I read a project by a student whose relative developed modern taxidermy techniques, and another who studied Alfred Russell Wallace, a near-forgotten British naturalist who co-developed the theory of evolution. As a website judge, I was awed by what the students were able to do. After my experience, I decided that I would dive into using National History Day in my classroom the following year with my eighth grade students at E.L. Haynes PCS. My students participated in the local D.C. competition. The element of choice is a blessing and a curse. Many students never have the opportunity to decide on their own topic for a project, let alone decide the format in which they present it. This choice is incredibly important for many kids, who throw themselves into researching a passion or how to make a website. I’ve seen students channel their extracurricular interests into successful NHD projects. In fact, students who had been completely checked out of the class for the whole year really threw themselves into their projects! Several students who had failed 1st and 2nd quarters ended up with Bs for the 3rd quarter (when their projects were due!). However, other students were paralyzed the paradox of choice: they couldn’t commit to anything, and then weren’t in love with the topic they eventually chose. These students struggled to complete their projects at all. Set realistic goals for yourself and your students. I met a teacher who had been doing NHD for a while who told me her students had to have 15 sources: 5 primary and 10 secondary. This was really challenging for a lot of my students. I think that for the vast majority of kids, it would have been better to focus on a few key resources and really dive into understanding them, rather than try to cover so much material. Start early enough so that you have time to meet with each student and create a realistic research plan. This is really hard. Taking a group of students to the DC citywide competition was eye-opening. I was proud of the work that my students who won our school competition had done; after all, they had worked so hard! But that didn’t matter when they faced such stiff competition. Reading the feedback that the judges at the city had for my students really helped me see what my students’ projects were lacking. I was able to reflect on how I could improve my own preparation, instruction and feedback so that I could be a more effective guide. Students who participate hit all the common core standards. If you do this project well you practice research skills, you read informational texts, you compare information from different sources, you make arguments backed up with evidence, you integrate visual information with other information, you speak to strangers about a topic, and so much more! When students go home to work on their projects, they are reinforcing all of the skills you teach them in class. In fact, studies show that students who participate in NHD outperform their peers on standardized tests in multiple subjects! What better test prep could you imagine? It’s all about the kids. This year, I judged websites at the national competition again. When we met with each student I asked each one whether his or her teacher had provided much guidance. Every single student said that while their teacher encouraged them, they really had relied on themselves. Two students hadn’t even done their projects for a grade: they did it because they thought it was fun. At the end of the day, National History Day should be fun. If presented properly, kids should be engaged, curious and excited to work on their projects. Learn more about National History Day. If you are looking for someone to give feedback on your students’ projects or judge a schoolwide competition, please contact Faye Colon (fcolon at teachingforchange dot org).